Title: Looking out the back of the "Pennsylvanian"
Description: New SD-50s on the IHB head east. Description: OIBU and its 125 cars sit on the main near Hales Eddy on New Years Day. Apparently it outlawed here, and since there was no traffic to speak of, they just sent the crew van to get the outlawed crew, and will recrew tomorrow after the holiday. Go figure. Description: BUOI rolls through BD and the late day haze of summer, soon to be rolling high across Starrucca and on into the Delaware valley as night falls. Description: Train 265 stops to get check engine as the unit rolled into Pomona yard with the Triple Crown dead! 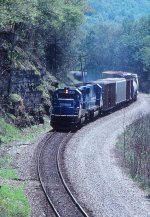 Description: Conrail, in addition to the extensive Trailvan network, also ran a comprehensive set of automotive trains. This is one of the empties, ML 403, is heading from New Jersey to the Detroit area with 96 empty racks. Description: CR 6799 is on the point of SEAL at Bear Mountain, NY 11/1998.